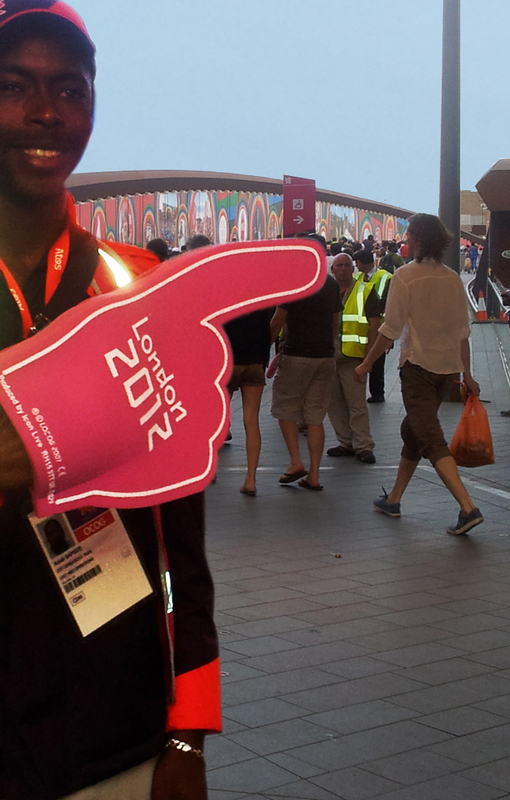 How do you bring 7 million spectators to the greatest show on earth safely and efficiently? The answer to such a logistical challenge, surely one of the hardest London has ever faced, needs careful planning and collaboration between key stakeholders (LOCOG, ODA, TfL). 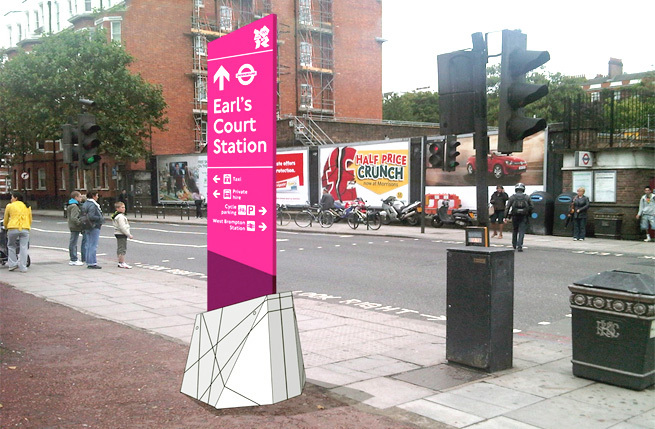 The ‘magenta trail’ was a key part of the London 2012 temporary wayfinding and signage strategy and we played an integral part in its design and implementation. 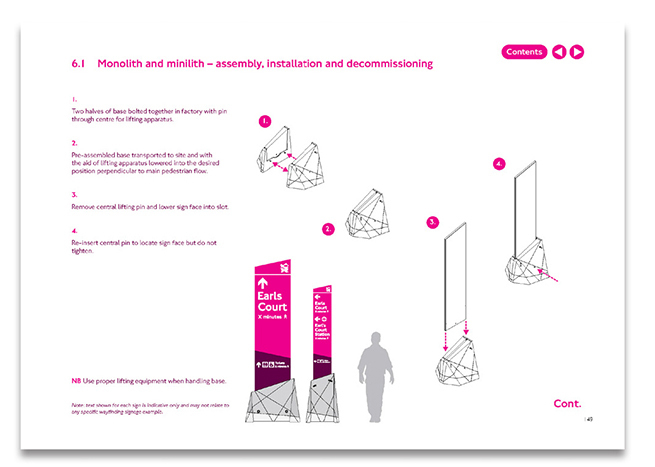 For this a blueprint (Kit of Parts) was created for temporary infrastructure signage including graphic overlays for static, movable and dynamic signage. 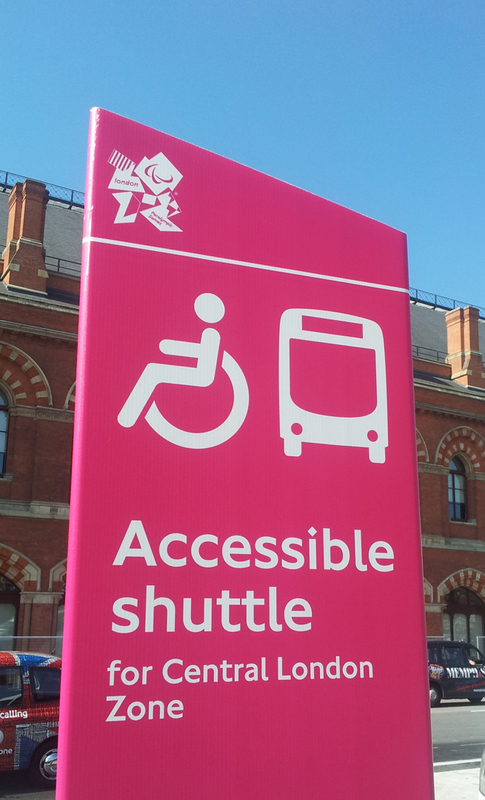 Providing safe, efficient and inclusive transport for the London 2012 Olympic and Paralympic Games has been one of the biggest transport challenges that London and the UK have ever faced. 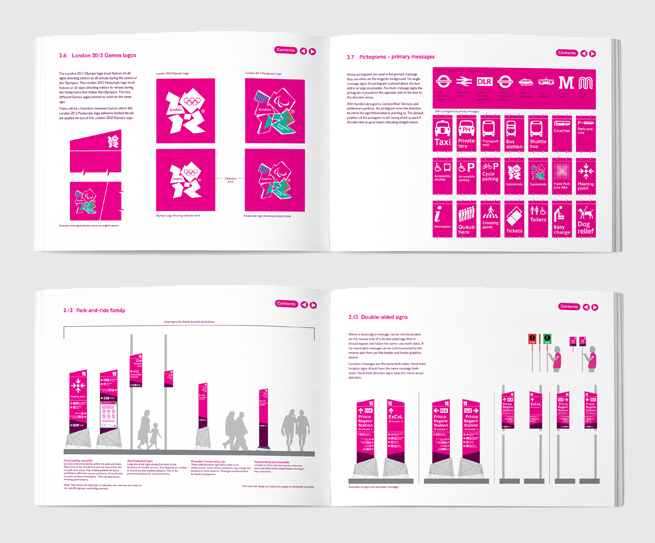 With up to 275,000 spectators travelling to and from Olympic events on a daily basis, it was essential to build consensus between key stakeholders including London Organising Committee of the Olympic and Paralympic Games (LOCOG), Olympic Delivery Authority (ODA) through a close working partnership with TFL’s own design team and key managers. 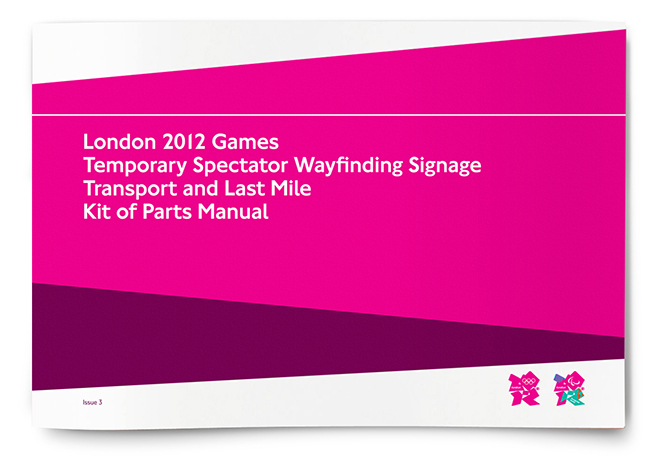 Incorporating best practice from previous Olympic and Paralympic Games we began setting out the ground rules for a temporary wayfinding strategy and then devised the signage infrastructure in a Kit-of-Parts manual. 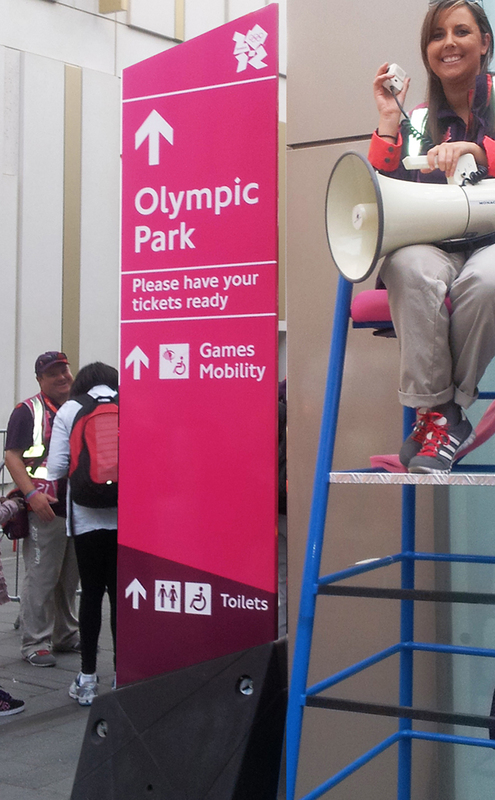 The KoPM had to cater for every type of eventuality and location from simple directional signs showing the route to an Olympic venue or station through to signage for disabled pick up points and interchanges. 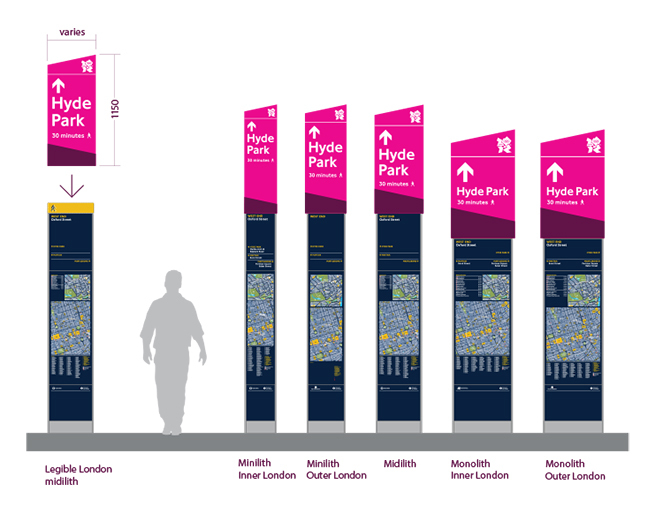 We formulated the graphic principles, the messages and the structural designs to ensure the wayfinding system performed at maximum efficiency in terms of legibility, scalability, cost and application across a variety of media. We also showed how the information had to be consistently set out on each of the signs with rules governing size, positioning and order of messages. 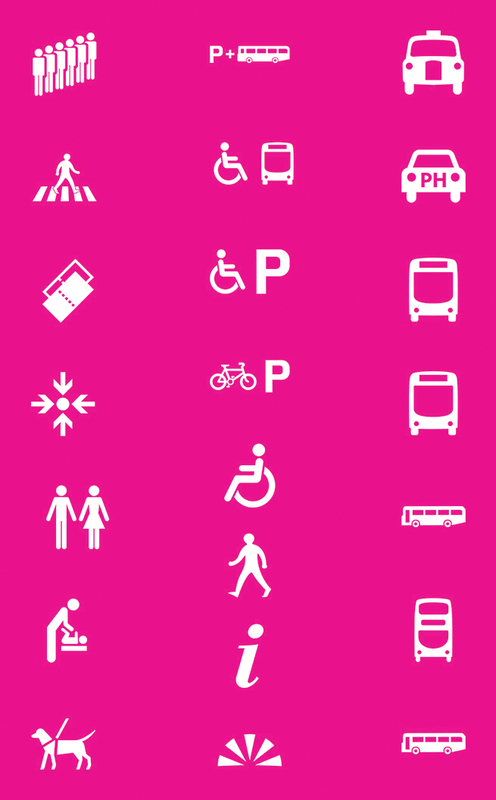 Directional signage to and from venue and transport nodes (rail, bus, tube, etc.) 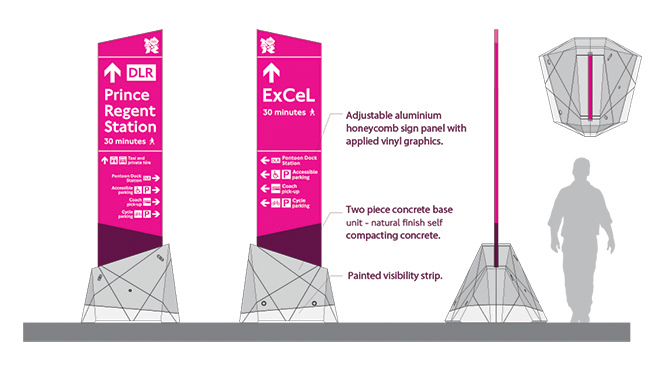 including wall-mounted and lamppost-mounted signs and information monoliths were designed with a distinctive style to enable signs to be spotted from a distance. 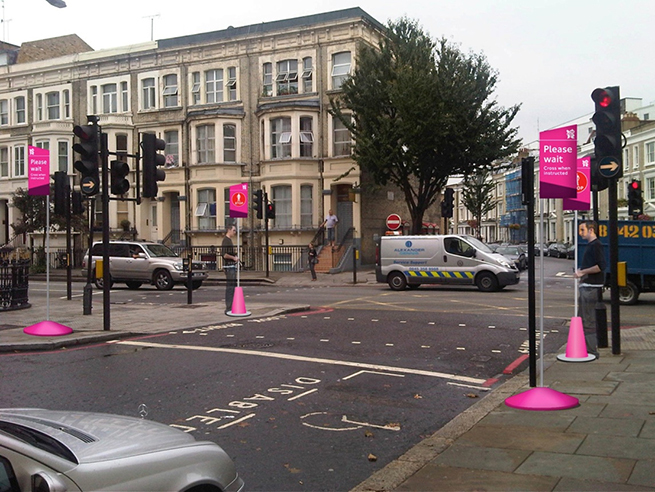 The colour chosen for the signs was magenta which was bright in appearance but more importantly was not a colour used for any transport mode. 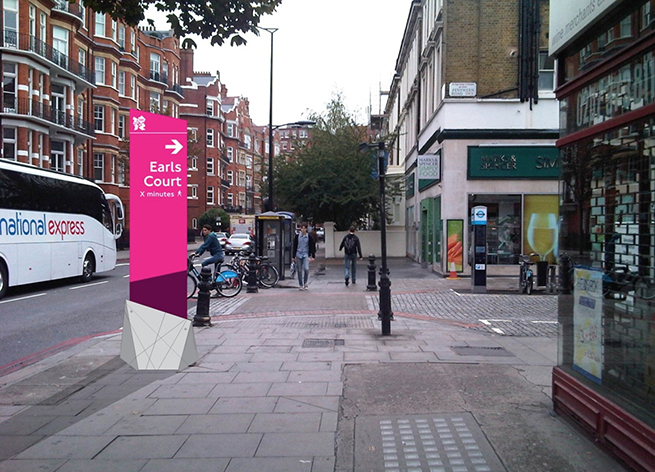 The easily repositioning and versatility of the pedestrian wayfinding signage was a key consideration for the team. 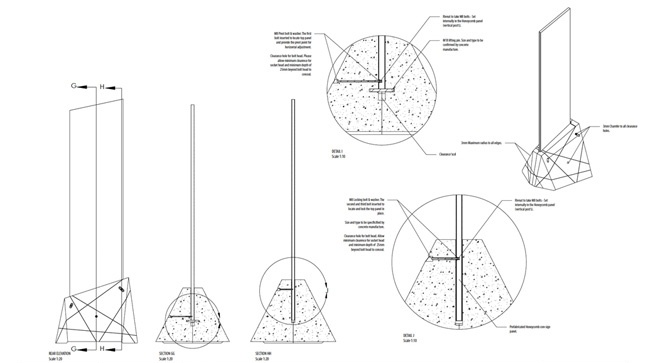 Design constraints included the ability to withstand high winds, exuberant spectators, as well as being easy to install, dismantle and recycle. 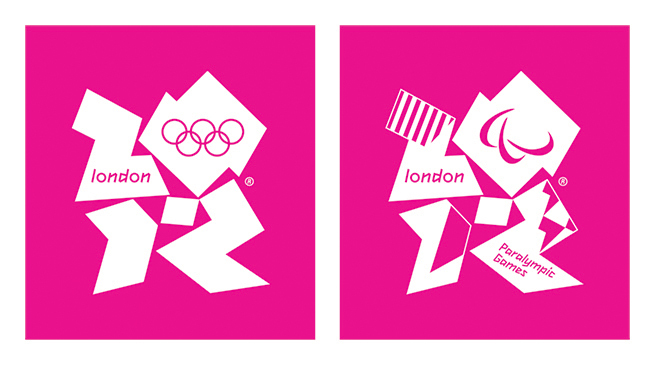 The London 2012 Games was widely regarded as being one of the most successful ever in terms of organisation. 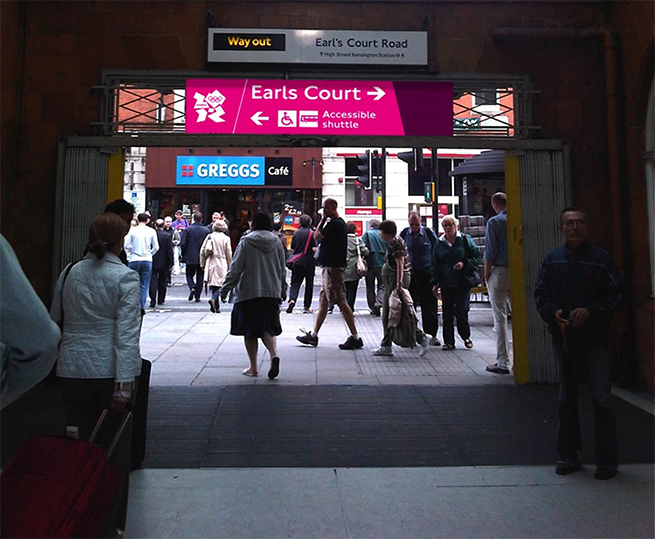 The clarity of the signage system enabling visitors to get easily round the sites and public transport system played a large part in this. 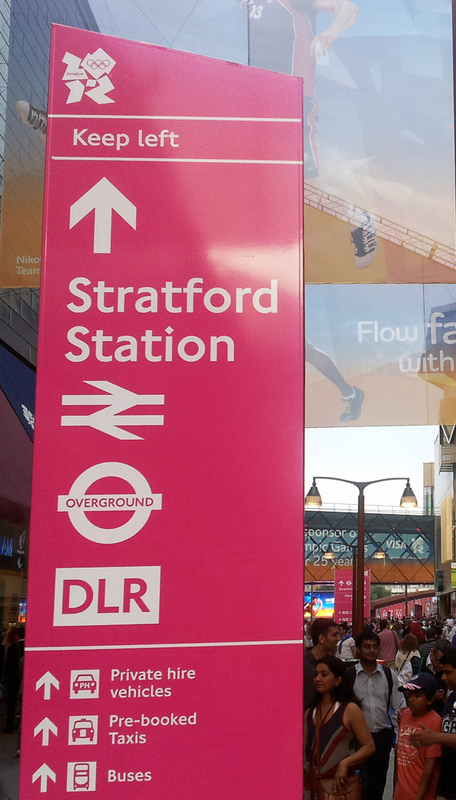 Along with LOCOG and TfL, the signage design system was nominated for the 'Design of the Year 2013' by the Design Museum, within the category of Transport design.